.... if I do say so myself! This is how it presents, flat. This is how the card opens/unfolds. While working on cards to post for the upcoming Motions and Folds Card Blog Hop (Feb. 26), I experimented with the tri-fold shutter technique. As long as I pay attention to the measurements when cutting instead of becoming engrossed in HGTV on the television, these are easy to make. Start with a piece of cardstock that's 12"w x 6"h. Lay the card horizontally (12") along your surface or Scor-Pal, and score at 2", 4", 8" and 10". You'll now want to cut along the width from the 2" mark to the 10" mark, but put the cut 1.5" into each side of the 6" side. (This is where I got distracted on my cutting!) Zig-zag fold. It's dawning on me that my description of the technique just using words is not doing it. 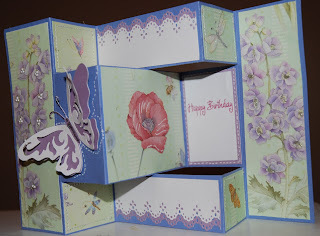 For an excellent video on how to make a tri-fold shutter card, click on the lilac-colored blog hop picture/icon on the right hand side of this blog. --> There, you will find a video I lifted off of YouTube. The video was done by Sarah (one of the hop stops) whose blog is at www.simplyshaddock.com. Sarah is does a PERFECT job in showing this technique in this, her first (of what I hope will be many) videos! 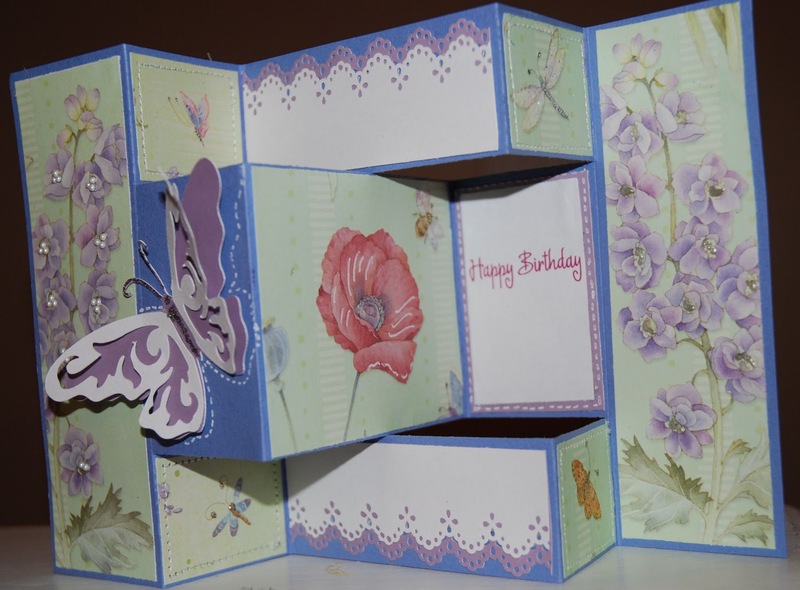 After you cut the card, dressing up the plain cardstock is up to your imagination. For mine shown here, I used a favorite Brenda Walton stack of papers that has a lot of flowers. This card is for a dear friend Barbara, who annually grows the most amazing English garden in blues and purples. 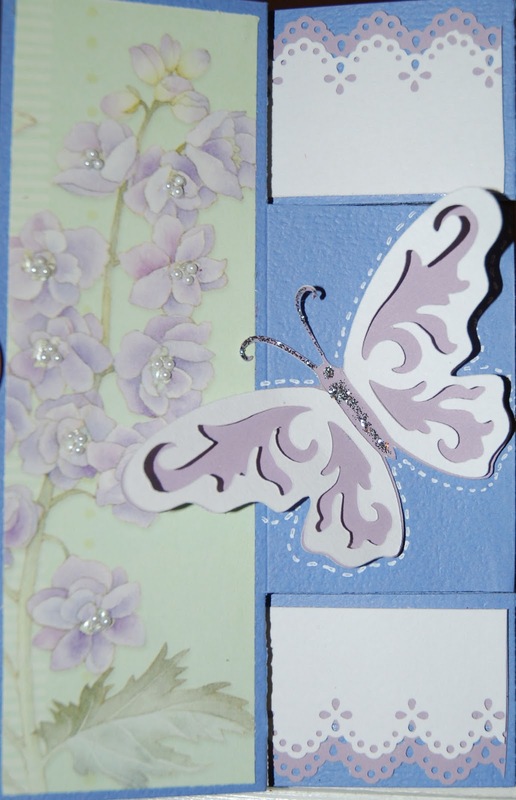 The butterfly was cut using a Cricut cartridge, and I Stickled the body and antennae. I also punched the eyelet lace paper using a Martha Stewart punch-around-the-paper, and adorned the bugs with Stickles and the flowers with pearls and Liquid Pearl. I typed the sentiment using my computer, oh, and I machine stitched around the small bug pictures. I ♥ how this turned out, and hope you do too! ... and Happy Valentine's Day to you and yours! !